It seems that hackers are crazier about creating ransomwares for extorting people in recent days. Although there are different kinds of ransomware, almost all of them have a change in form but not in content. Fake Police Central e-crime Unit (PCEU virus) is such one without exception. Let’s learn about it comprehensively. 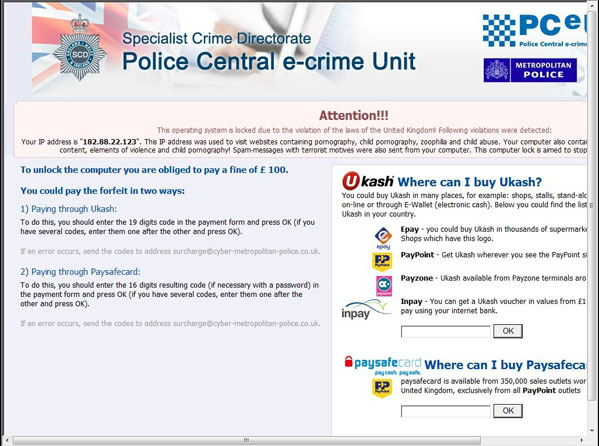 What is Police Central e-crimeUnit (PCEU) Ransomware? 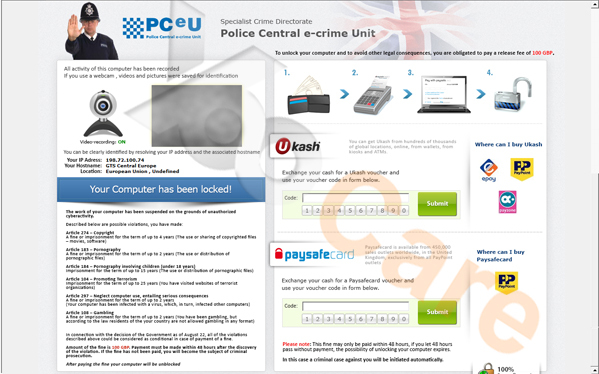 Police Central e-crime Unit (PCEU) ransomware is designed by cunning hackers for illegal purpose to lock people’s computer asking for ransome/penalty,very similar to Canadian Security Intelligence Service (CSIS) Ukash virus ransomware, in order to cheat and threaten netizens more easily, they design an interface/appearance just like it’s originated by government offices. And, Police Central e-crime Unit is UK’s Metropolitan Police. But it has nothing to do UK’s Metropolitan Police. Hackers just want to threaten people via taking advantage of their fragile psychology in the name of Police Central e-crime Unit. Compare to Fake antivirus malware, this one is more aggressive, deceptive and like a robber. There are lots of routes of transmission. It may hide in some malicious websites for your visit or may be bundled with some video files or programs, when you download these files, you also download this stuff. Or even pretends to be a normal program puzzling you. No matter in which way, once it accesses your computer, it will install in your computer automatically without your permission. After it’s installed in your computer, Police Central e-crime Unit (PCEU) ransomware will configure to start automatically every time your computer is started. Before you can do something, it will take over your screen and lock your computer so that you can’t do anything to get rid of this pest. Police Central e-crime Unit alerts will report that your activities violate the laws of United Kingdom government and the operating system is locked to stop your illegal activity. To make it appears real, It even will show your IP address as detection and claim you must pay a fine of 100 pounds. 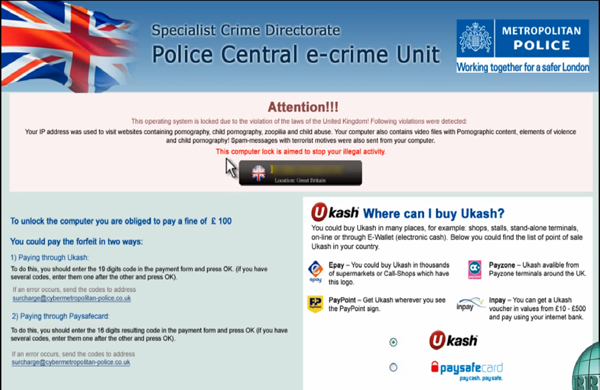 In addition, users are asked to pay only through the Ukash or Paysafecard. Attention!!! Under the laws of the United Kingdom and Investigation of Metropolitan Police Service and Strathclyde Police Your computer is locked to prevent illegal activity in the network. From this IP-address [removed] it was visited sites containing banned scenes of violence against people, as well as viewing banned in United Kingdom child pornographic materials. We discovered video files that contain elements of violence were found on your computer. Unsolicited Bulk Messages was send from your computer’s IP address and it was recorded by SpamHaus this month. The computer has been locked to prevent your illegal activities on the Internet. To unlock the computer you are obliged, within 48 hours of receiving notice, to pay a fine of £100. Of course, all of this information is totally fake. Never consider to pay for that because even if you do so, you still cannot unlock your computer. You need to remove this nasty malware as soon as possible before it brings you more harm.
? Damage network order so that creating fear and panic and if the cyber frauds succeed for a time, they will be more wild. 1. 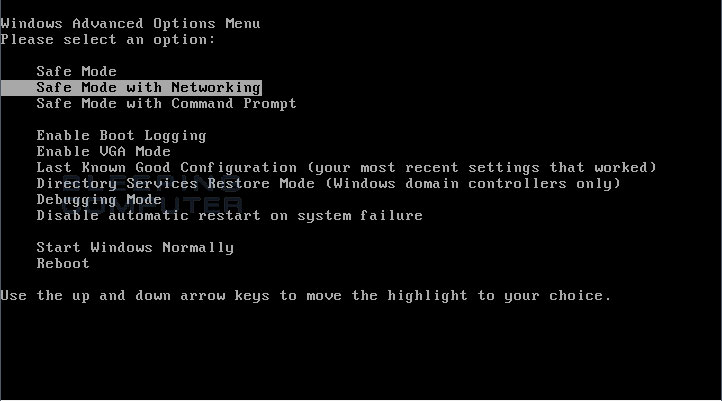 Restart the computer in Safe mode with networking, press F8 key constantly before Windows launches. 2. Select Safe mode with networking and press Enter key. 3. Delete the related registry Entries. 4. Finish deleting manually delete Police Central e-crime Unit (PCEU) Virus manually.